Texas Instruments has launched a pair of ICs designed to simplify wireless power solutions for mobile devices, consisting of a single-chip wireless power receiver with integrated battery charger and a ‘free-position’ transmitter that enlarges the charging area by a factor of four. The bq51050B is the industry’s wireless power receiver compatible with the Wireless Power Consortium (WPC) 1.1 Qi standard. It features an integrated direct battery charger and enables faster, more efficient charging of portable devices. The unique 20-V receiver combines rectification, voltage conditioning, communication control and Li-ion charging capability in a single chip. The inductor-free, single-stage design yields high efficiency and saves up to 60% board space compared to a multi-stage implementation. The companion bq500410A is the first WPC 1.1-ready wireless power transfer controller that allows a Qi-compliant portable device to charge inside a surface measuring at least 70 by 20 mm, four times as large as the current 18 by 18 mm charging area. 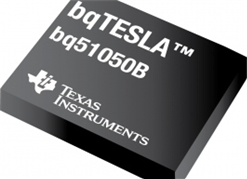 The bq500410A achieves greater than 70% efficiency and has a unique parasitic metal and foreign object detection feature to protect the system and stop power delivery if a metal object is detected between the transmitter and receiver.